Full Service history with original Service book!! 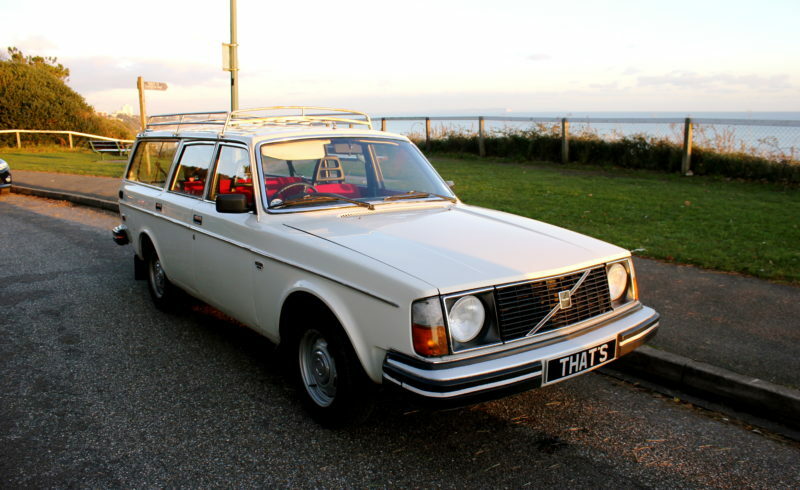 Here we have an excellent opportunity to own an original Volvo 245 estate from 1977 with the super rare Round headlight’s!!! I have owned the car since April of this year and have covered around 300-400 miles in it. I use it as a second car if I need to go anywhere locally when my fiancée isn’t using our new car. Hence the little miles I have put on the car. The only reason I am selling her is that I have bought myself a boys toy which is now occupying my garage. My plan was to keep the Volvo in storage over the winter and bring it out next year for a few summer drives but I find it a shame it will not be used regularly. The car has had 2 previous owners the first from new (1977 – 1980) and the next from 1980- 2012 (32 years!!!) It has always been garaged from new!! I have the original logbook and full service history as you can see below. I have also added a Vintage looking roof rack which has had newly refurbished wooden slates painted in gloss boat varnish for longevity. The metal on the roof rack could do with being sprayed now as the colour has gone slightly. The interior is in excellent condition with no stains or holes, it has the original Volvo rubber car mats. It has 5 months Mot and 4 Months Tax, if you want I can put on a new 12 months mot (at buyer expense) as it has only covered about 400 since the last mot and should go through with no problems. This was the first owner from New to 1980 – It was purchased by the 2nd owner who was a dentist and a keen mechanic. He serviced it very regularly from this point onwards. Unlike most home mechanics he documented every bit of work that was carried out on the vehicle in a note book which is still present. Being a dentist (like doctors) they don’t always have recognisable handwriting so I have typed up the full history – email on request. As you can see this car was very well looked and incredible thorough. The speedo had stopped working when I purchased the car and after looking through the service history I estimate the mileage to be about 75,000 – 80,000 miles currently. I am a classic car dealer and buy and sell many classic vehicles from 1960’s and earlier to hot hatch of the 1990’s . I have driven many different vehicles but this Volvo drives so fantastic you wouldn’t believe she is 35 years old by the way she drives and real Practical Classic!! Hence why I couldn’t bring myself to sell her earlier in the year, but I cant keep this as a 3rd car that’s just not practical. It is 35 years old and there are a few age related marks here and there and some small bit of rust too (nothing structural) The only major negative part about the car is the passenger side rear arch has quite a bit of filler in and ideally would need some work to make it perfect. If you want this car, I suggest you come round and buy it quick because there is a good chance I may be persuaded to change my mind and keep it in storage after all.